× Liz Alton is a freelance B2B writer and content strategist based in Boston. Her work on finance, technology and marketing focuses on helping small and mid-size business owners make smarter strategic decisions. She’s written for national brands including Google, Twitter, Adobe, IBM, Oracle, Hewlett Packard, CenturyLink and many others. As you’re slowly coming down from the rush of the holiday season, you’re probably thinking about your small business goals for 2019. Whether you’re aiming to find ways to increase productivity or lay a foundation for business growth, it’s important to outline your goals and create a plan to achieve them. Don’t let your New Year’s business resolutions get overshadowed by your day-to-day tasks. Instead, here’s a closer look at how to effectively turn your resolutions into achievable small business goals for 2019. A new year brings the possibility for growth, especially when you focus on your small business goals. You may be wondering how to expand your business to get the best results. One way companies can fuel growth is finding and converting new customers in the year ahead. Turn this vision into an actionable road map. How many customers do you want to attract, and what type of customers are you targeting? How much is each of your current customers worth to your business, based on the average amounts they spend throughout the year? What’s the best way to find and market to similar customers? 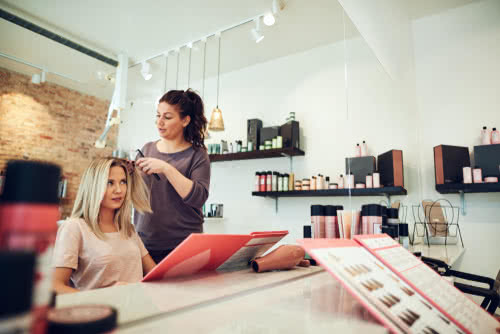 For example, a stylist might set a goal of attracting 20 new customers who come in for monthly appointments and spend at least $100 per visit. Their marketing plan might include ads in the local newspaper and networking on social media. Once you understand which customers you’re trying to connect with, you can explore different marketing and outreach strategies to help you achieve your goal. As the old adage goes, it’s more expensive to find a new customer than it is to keep an existing customer happy. Do you want to further cement relationships with your current customers in the year ahead? Business owners are increasingly focused on offering a great customer experience. Think about different ways to achieve that goal. For example, a store might develop customer service support strategies to better meet customer needs, or find ways to increase convenient online ordering, such as partnering with a courier service to offer same-day delivery. Stay on track with your customer-focused goals by making them S.M.A.R.T: Specific, Measurable, Attainable, Relevant and Timely. Look at what’s missing in your current customer support and experience, set clear goals, and then measure your success against them. Running a business can be challenging. Effectively managing your finances means accounting for many different variables, while constantly adapting to changing priorities. You may be joining the small business owners who are looking at 2019 as the year of getting their finances in shape. Whether you need to get a better hold on your larger financial picture, reduce expenses or increase profits, strategically managing your money can help. Outline exactly what you need to know, and use that information to help you operate your business more effectively. For example, let’s say your goal is to save money in 2019. You’ll need to look at your spending for the past 12 months, and identify the top three to five areas you can save money. You’ll then need to take specific steps, such as finding alternative vendors or eliminating unnecessary spending. Maybe you will clean your own store after hours this year, instead of hiring a professional. Increase your chances of success by relying on an accountability partner who can keep you on track. Your bookkeeper or accountant can be a great choice. Taking the leap and growing your business often requires small business expansion funding. A bakery that’s opening a new location needs operating capital for rent and equipment, while a store owner that’s increasing sales may need funds to buy inventory or cover payroll. Expansion funding is a natural part of the process. Today’s business owners can access funding from a variety of sources. Some of the most flexible small business loans are available from alternative lenders. If the thought of applying for a loan through a traditional lender has you imagining weeks of paperwork, you’re not alone. Set a goal to explore your options for small business loans with an alternative lender instead. Typically, you can apply online, supply minimal paperwork and get a response in just hours or days. When you’re at the helm of a small business, it often feels like there’s never enough time to get everything done. Increasing your productivity can help you work more efficiently, and allow you to support more clients. It can also enable you to work fewer hours so that you have more time for your family and life outside of work. There are endless strategies for increasing your productivity, from systems like Getting Things Done to technology apps like Todoist. Start by deciding what productivity looks like for you, and then think about what kind of support you need. One business owner I know wanted more time for marketing, so she set aside one hour each morning to write blog posts, set up ad campaigns and check in on social media. The simple act of making it a priority kept her on track. A catering manager I worked with wanted to handle the invoicing, ordering and staffing needs of his business more efficiently, instead of working late into the night when he’d rather be home with his kids. He explored a variety of technology tools and settled on apps that let him work on these critical areas of his business from anywhere. There’s no one-size-fits-all solution for productivity, but defining your pain points and goals allows you to create custom solutions that work for you. Setting and attaining your small business goals for 2019 is achievable. Don’t get overwhelmed by everything you need to get done or side-tracked by your day-to-day responsibilities. Turn your vision into a series of small business goals, create a timeline, find support and invest in the tools you need to get it done. Next year, you’ll be able to look at all you’ve achieved and how you set the foundation for ongoing success in 2020 and beyond.